We’ve brought our great big chocolate eggs back but added in a new flavor. Milk chocolate hazelnut is joining this (unequally divided) dozen. Please please, hold your applause. 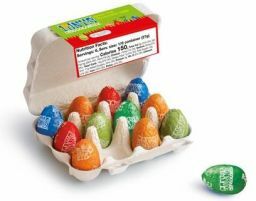 But wait.. if there are 12 eggs and 5 flavors, wouldn't that mean there isn't an equal amount of flavors in each carton? Yes, eggs-actly! As long as the chocolate industry is unequally divided, our bars (and eggs) will be too. Sugar, cocoa mass, dry whole milk, cocoa butter, caramel pieces (sugar, glucose syrup (wheat), cream (milk), butter (milk)), almond, hazelnut, sea salt, soy lecithin. Cocoa solids: 51% (dark chocolate), 32% (milk chocolate) minimum. Which is which? Red: milk chocolate, Blue: dark chocolate, Orange: milk chocolate caramel sea salt, Green: dark chocolate almond sea salt, Dark green: milk hazelnut.